You’ll have to come back and tell us how it goes! I’d like to see it, but I don’t like the cold either. You’ll have to share your experience Renee, a jacuzzi? Yes, I’m still fascinated by how that’s possible. They do tours of the ice hotels so even if you don’t think you could sleep there, you could still check it out. I’ve wanted to stay in one since I first saw them on tv (maybe it was in a Bond movie?). They’re gorgeous and I think it would be an amazing experience. I love sleeping in the cold, so it would be perfect. I don’t think I’d want to stay there more than one night, but I definitely want to stay for a night. Like you, I’ve wanted to go ever since I saw them on TV (for me I think it was the discovery channel). 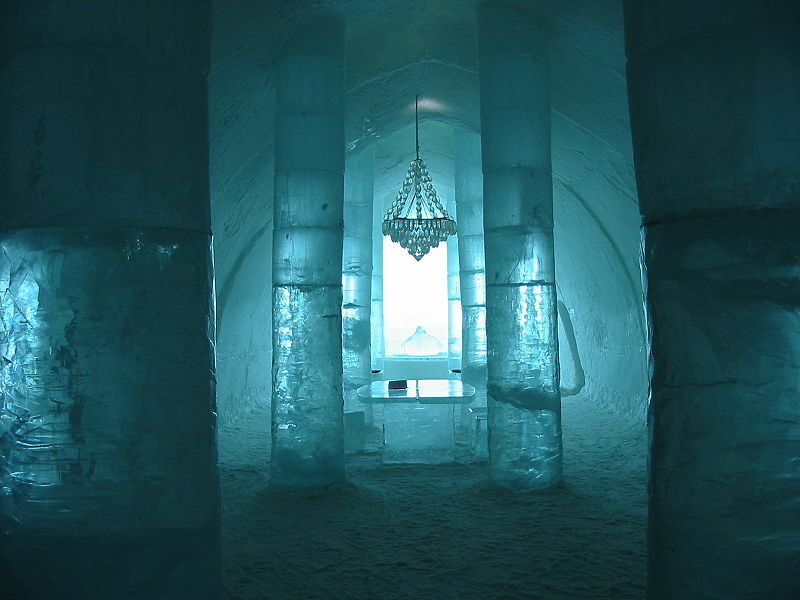 I lived in Thunder Bay for 8 years – ice hotels hold no appeal for me at all. I don’t need to sleep on a block of ice to see the northern lights. I could see them from the comfort of my living room – and typically they only come out on the coldest of nights. When the snowbanks on each side of the sidewalk are taller than your head the cold stuff loses its allure. I love to look at it, beautiful. Sleep in it? Never. I get a headache just thinking about it, like eating ice-cream too fast and getting a brain freeze. Lol,Lisa, on ‘sleeping in a block of ice.’ Yeah, no appeal in that. I saw this on TV several years ago and have been fascinated with it ever since! Yes, I’d like to stay in it, even though I have my doubts as to how pleasant that would be! Then again, good excuse to drink several shots of chilled Sambuca. 🙂 I think there might be an ice hotel in Alaska, too, although I’m not sure if that one’s 100% ice. having survived many winters in Calgary, I can’t imagine sleeping in an ice hotel. Yuck. Different strokes I guess. Don’t know if I’d sleep there, but it’d sure be cool to visit. I like my heat in the winter. Cool, so to speak. That would be as close as I can probably get to the fantasy I used to have as a kid of staying the night in the dinosaur part of the Universe of Energy ride at Disney World, with mist being sprayed on me and audio-animatronic brontosaurs roaring. Ooh, great new feature. I can’t wait to see the next unbelievable real life post. Ice hotels are really beautiful and it would be a real experience to sleep in one. We have one in Northern Finland too. Living in a place that gets real winter, the cold wouldn’t be an issue. Ice bar would be fun to try too.